Purveyor of select olive oils and balsamic vinegars from around the world. Your hosts, Dave & Catherine Ferraresi provide a unique tasting experience at 461 Main Street in Chatham village at the Mayflower Retail Shop complex. 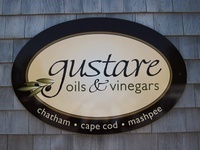 Gustare offers over 40 varieties of imported EVOO products from several countries and traditionally aged balsamic vinegars sourced directly from Modena, Italy. Our guests enjoy a 'fresh and flavorful' tasting experience by sampling unique flavor infused olive oils and balsamic vinegars bottled within our shop. Catherine is happy to discuss private tasting events hosting up to 20 guests during our off-season hours. Gustare is a proud community builder supporting Cape & Islands United Way, WE CAN, and CapeAbilities non-profit organizations.